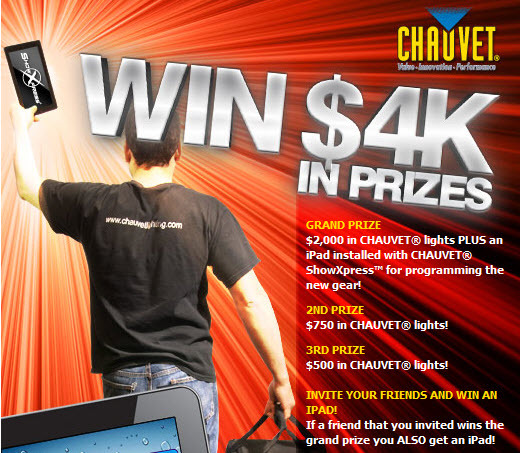 Chauvet, a top leader in nightclub lighting is giving away $4k in prizes to a few lucky winners. To enter, visit the Chauvet Facebook Page and fill out your info. First prize is awesome, $2k in Chauvet lights which will get your lighting arsenal up and running, as well as an iPad installed with their new ShowXpress, which is their newest computer programmed lighting language. It's a simple plug and play software which allows you to interact with your lights right from your iPad. From enhanced pixel mapping for 2012, this little software package is exactly what you have been waiting for. Second and third prizes are also available so make sure you enter for a chance to win some fantastic prizes. Sorry rest of the world, US or UK residents only... 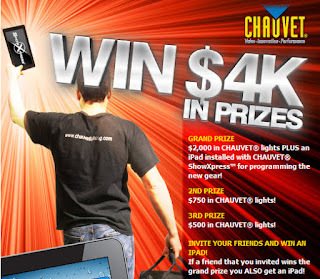 But if you are a resident, simply go to the Chauvet $4k Sweepstakes for a chance to win. For information on the New Chauvet Freedom collection, visit ellumiglow.com.